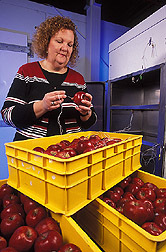 Entomologist Lisa Neven inserts a temperature probe into an apple to monitor fruit temperature during a CATTS (Controlled Atmosphere/Temperature Treatment System) procedure. Fruit-loving insects beware: A technology called CATTS, short for “Controlled Atmosphere/Temperature Treatment System,” may soon be coming to a fruit packinghouse near you. When that happens, fruit packers will be using this pesticide-free technology to kill insects infesting apples, peaches, pears, cherries, or nectarines destined for foreign markets. An approach first conceptualized by scientists in the 1930s—but technologically realized for today’s fruit packers by ARS entomologist Lisa G. Neven and colleagues—CATTS rids stored fruit of live codling moths, oriental fruit moths, and certain other insect pests by exposing them to a lethal combination of rising temperature and mixtures of low oxygen and high carbon dioxide levels. Methyl bromide fumigation has been a chief means of disin-festing export-bound fruit. But the chemical is expensive, costing about $10 a pound, and all but exempted uses are prohibited in the United States because of environmental and other concerns. Since 1995, Neven has worked to position CATTS as an affordable, nonpolluting methyl bromide alternative that can be incorporated into commercial packinghouse operations and quarantine facilities. A codling moth larva crawls out of an apple it infested. Done correctly, the treatment causes no significant change to the fruits’ appearance, texture, taste, or aroma, says Neven, who is in the ARS Fruit and Vegetable Insect Research Unit, Wapato, Washington. Indeed, in tests, CATTS-treated peaches and nectarines maintained their quality for longer in storage than methyl bromide-fumigated fruit. Neven has completed the last of three confirmatory tests on CATTS’s ability to kill codling moths in organic apples. ARS will present the results to its sister agency, the Animal and Plant Health Inspection Service, for approval as a quarantine pest-control measure. To qualify for such certification, and ultimately win the confidence of a major trade partner such as Japan, CATTS fruit treatments must be 100 percent effective at killing the insects. Besides apples—and sweet cherries from earlier research—“I have completed confirmatory tests against codling moths in peaches and nectarines using two CATTS treatment regimens,” reports Neven. “We also completed two efficacy tests against oriental fruit moths using the same treatments.” She also ran efficacy tests against the pests in apples using a commercial CATTS unit operated by Pac Organic Fruit, an organic packinghouse in George, Washington. Her collaborators are Stephen Drake, in ARS’s Physiology and Pathology of Tree Fruits Research Unit, Wenatchee, Washington; David Obenland in ARS’s Commodity Protection and Quality Research Unit, Parlier, California; Elizabeth Mitcham at the University of California-Davis; Harold Ostenson of Pac Organic; and Dan Black, of Techni-Systems, who engineered the CATTS machines in Chelan, Washington. Technician Linda Renfield applies codling moth larvae to an apple while technician Dan Hallauer cuts open an infested apple in search of dead larvae. The scientists’ Washington State-California collaboration is as much a pooling of resources and expertise as it is a matter of economics: The two states, along with Florida, produce the lion’s share of America’s $9 billion fruit crop (figure excludes citrus). California is the top fruit producer of the three and also leads the nation in agricultural exports. The importance of such international trade means that packers and packer-grower cooperatives must take special care in making sure their shipments are pest free. Otherwise, an importing country where a particular insect pest doesn’t already occur may reject the shipment or declare an all-out ban on further shipments. Codling moths are a familiar foe to growers. 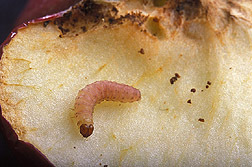 And consumers know them as the proverbial “worm in the apple.” After emerging from its egg, a codling moth caterpillar bores to the core of an apple to feed and develop. It then exits to pupate, leaving behind a damaged apple that’s often unfit for sale. Two generations of codling moths can emerge to plague apples during the Washington State growing season—one in spring, the other in summer—and three or four generations in warmer climates, like California. Pesticide use, pheromone-assisted mating disruption, and insect parasitism and predation can all inflict a heavy toll on this orchard pest’s numbers, but some can still find their way into harvested apples. Neven envisions CATTS being most effective in mopping up those stragglers. “You can bring the fruit straight in from the field and subject it to the treatment,” she says. In studies, her group tried many combinations of temperature, incremental heating rates, and O2-CO2 blends before settling on two optimal treatments to disinfest fruit. The one incrementally heats fruit to a core temperature of 44˚C over 4 hours; the other heats it to 46˚C over 3 hours. Both use a 1 percent O2/15 percent CO2 atmosphere. The fruit is then cooled before storage and shipping. Neven says these treatments can be fine-tuned to accommodate different cultivars or packing regimens, such as storing fruit in bins versus pallets. Using Pac Organic’s CATTS unit, “We’ve demonstrated that we can treat packed boxes of peaches and nectarines,” says Neven. Now, in collaboration with the California Tree Fruit Agreement, Neven and Obenland are exploring ways to treat pallet-stored fruit, further preparing the technology for commercial use.—By Jan Suszkiw, Agricultural Research Service Information Staff. Lisa G. Neven is in the USDA-ARS Fruit and Vegetable Insect Research Unit, 5230 Konnowac Pass Rd., Wapato, WA 98951; phone (509) 454-6556, fax (509) 454-5646. "Heat + Low Oxygen + High Carbon Dioxide = Dead Fruit Pests" was published in the July 2005 issue of Agricultural Research magazine.